Avast! Thar be ghastly things that sail these waters! Whether labeled privateers or buccaneers, everyone feared pirates during the Age of Sail. Now the pirates have something to be afraid of... the livin' dead! 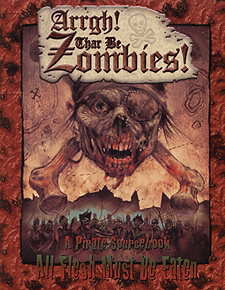 From voodoo queens to ghost ships, swashbuckling with zombies is a whole different jug of grog. So tighten them sails! Hoist the Jolly Roger an' go on the account with the brethren o' the sea! But 'ware the shout from the crows' nest, "Arrgh! Thar Be Zombies!" They'll be after more than ye gold! So trim the sails and hoist the Jolly Roger. Arrgh! Thar Be Zombies! Information on the Age of Sail and the Golden Age of Piracy, including everything you need to know about life as a pirate. Plenty o' new Qualities, Drawbacks, and skills for yer piratin' crew. New Zombie Aspects for the undead spat forth from Davy Jones' Locker. New Metaphysics rules for voodoo Miracles, rituals and the creation of fetishes. Rules for cinematic sword-fighting and ship combat. Three full Deadworlds and two short ones, takin' yer sea dogs from a dark and shrouded isle to islands in a dark sea of an entirely different sort. A slew of Archetypes that can be used to flesh out any pirate game.